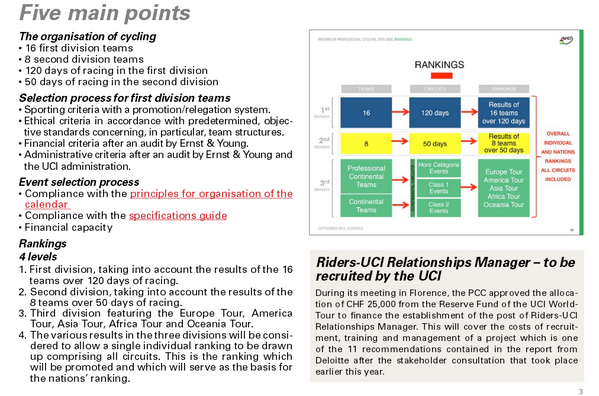 The UCI has now confirmed its plan for reshaping (And re-invigorating) the World Tour structure and teams. Originally planned for 2020 they now have brought this plan forward to 2018. No mention of the 80 day rider limit that I can see. how many days is the WT now ? its technically almost impossible to do. Grand Tours have 22 teams. 16 of those will come from the first division teams. That leaves a total of 18 Wild Card spots up for grabs. The 8 second division teams would only be able to ride one Grand Tour a year using up 21 days of their allocation (if they did 2 grand tours they would only have 8 days racing left). So that still leaves 10 wild card spots up for grabs. And 1st division teams wouldnt be able to race non WT (reduced WT) races.. It doesnt add up. at all. So no Poland, Eneco, Beijing and TDU and then include Paris-Tours again? That would be an upgrade to me, I know for sure though that won't be the races lost. My contemporaries won't like it because they are UCI supporters and globalists (notably OP who explained to us that the UCI never took measures to cut short classics) but I'm talking to further generations. UCI needs be dissolved before it's too late and the different national federations should take back the executive power at every races held on their own soils, like in the good old days. Of course there were injustices back in the days but nothing can be worse then this attempt to a New World Order that reminds us of Huxley's Brave New World or Orwell's 1984. 2nd division teams only allowed to ride 50 days. Isn't that a really small amount? I think it means that they will rde 50 days of the 120 total WT races, how those days will be distributed will be a mess, who wants to be the team that rides Vuelta, Beijing, Canada, Eneco, Poland and TDU only? Who in the world would be a 2nd div team then, when PC teams can get wild-cards to better races? I assume 2nd div teams can apply for wild-cards else it is pointless, unless no more wildcards, in which case good luck getting the ASO to take that deal, when Europecar and FDJ might very well be the teams to move down to reduce WT to 16 teams. None of this makes any sense. I dont actually think the UCI know what they are doing. theyve just put a bunch of numbers on a page and not actually considered how they are going to do it. I think a large number of teams, and race organisers will look at this and just say flip it. and make GT's only available to 16 teams? Well if Div 2 can't race with Div 1, wouldn't they have to? unless div 3 can get wild-cards, in which case how do you fill out div 2? lets see wild card at Dauphine and TdF or 50 days of Div 2 racing? EDIT: May have misread, I think the Div 2 teams does all the 50 days and then wild-card on top of that. What I said was in relation to one race and I said that having a maximum lenght was a good thing. As for the distance the is some positives for shorter races, but do think history to a point is good. How old d'you think I am, Caruut? From the initial “Common Ground” meetings between November 2011 and March 2012, to this approval, passing through the consultation of cycling’s stakeholders conducted by Deloitte last spring and a whole host of meetings, each stage of the process has been worthwhile and constructive, signalling the interest of all parties in the proposals. Ok, lets try do some maths on this. So we need to shed 34 days from somewhere. So lets take Paris Nice and Tirreno down to 6 days, along with Catalunya, Dauphine, Tour de Suisse. And lets reduce Poland, Eneco Tour, basque Country to five days. Net result, we are down to 140 days. Bugger. flip it, lets ditch Beijing, nobody cares about it anyway, and the stupid world championship team time trial. 135 days, only 15 to go. Grand Tours, lets reduce them all to 18 stages. Hmm, 125 days. Vattenfall cyclassic and GP Ouest France. GONE. 123 days. Hmmm, ok.. Lets reduce Basque Country, Poland and Eneco to four days. Hurrah. 120 days. So we are down to 12 days by chucking Beijing, Vattenfall and Ouest France out of the world tour, reducing half the races to 4 or 5 days and reducing the Dauphine, Paris NIce and Suisse to 6 days, whilst also slashing 3 stages off each grand tour. NOW WE NEED TEAMS TO FILL THOSE RACES. 120 days racing x 22 teams invited to each race = 2640 days. The 16 first division teams can each race 120 days, so thats 1920 days gone. Only 720 to go. The eight second division teams can race 50 days so thats another 400 off, so only 320 days left. So we simply need about 8 or 9 Pro Continental teams to fill the void. Bingo. Pro Conti - 16 maybe (Losing Europcar (wt), Crelan, Champion, Sojasun, Vini), gaining one, maybe two. So thats a total of 34 teams, maybe 35. Each Grand Tour has 22 spots up for grabs, 66 spots in total. Division one teams will take up 48 of those 66 spots. Leaves 18 spots remaining. So we will need at least 10 pro conti teams to fill the void assuming every single one of them rides a grand tour. So it could be done, just, but would mean every single Pro Conti team, would HAVE to ride a Grand tour to make up the numbers, that means Rusvelo, UHC, Accent Jobs, would all need to ride a grand tour. flipping GENIUS. Essentially, it's only possible if you rob most all WT races of their history (18-stage GTs? 4-day País Vasco? What the flip?). You know, it actually IS rather genius. The teams will like it (all ProContis get to ride a GT), the riders will like it (who doesn't want to ride a GT, and at the same time have some limit to how many races that serve him no purpose he has to line up in). The only ones who'll fight it are the race organizers who may break away from this scheme. And voilà, the UCI will introduce 4-day mickey mouse races (flat, mountain, ITT, flat) to replace them, as many of the previous races were cut down to 4/5 days anyway. • The season will now run from February to October. • Competition on every weekend, especially Sundays. • No overlapping of events.• No competition amongst first and second division events. • Six weeks of uninterrupted competition focused on the spring classics. • Stage races cut to five or six days. Paris-Nice and Tirreno not overlap? Giro and California not overlap? I am might be wrong but there will be still overlapping with 2nd division and 3rd division races with each other reduced overlapping is good though. 50 days of division one WT events? or 50 days of both division one+two events (with the rest made up of division three events)? So fifty race days that rules out who moves up and free to race any other races apart from that? wild-cards etc.? Sent a tweet may as well double up here. A comparison of the situation before the introduction of the ProTour, the current situation and what's planned for 2020 is interesting. In 2004, the last non-ProTour year with the old system of a world ranking and GS1-GS3, there were 30 GS1 teams, and 20 GS2 teams, for a total of 50 teams theoretically eligible for participation in what are now WT races. In 2020, if I understand the proposal correctly, there will be 24, plus possibly an unknown number of ProContinental teams.